Synovial cell sarcoma of the head and neck comprise less than 0.1% of all head and neck cancers.1 The first case of head and neck synovial sarcoma was described in 1954 by Jernstrom. The larynx is the least common site of occurrence of synovial sarcomas, making laryngeal synovial sarcoma an extremely rare disease entity. Due to the paucity of cases, the optimal treatment of laryngeal synovial sarcoma is yet to be established. Based on reports, wide local excision with or without adjuvant radiation therapy is usually the first treatment of choice. The role of chemotherapy remains controversial. We present a patient diagnosed with unresectable laryngeal synovial sarcoma who underwent neoadjuvant radiation therapy with concurrent weekly chemotherapy. The patient is a 22-year-old Filipino man, ECOG 0, with no known medical comorbidities or vices. He presented with a 7-month history of foreign body sensation in his throat. Thereafter, he developed hoarseness, pooling of saliva, and solid-food dysphagia. He then experienced difficulty breathing and sought consult. The patient underwent tracheostomy, nasogastric tube insertion and simple supraglottic excisional biopsy for what was thought to be a benign process. 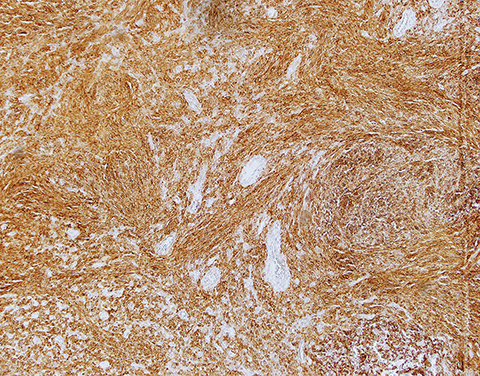 Pathologic examination demonstrated a malignant spindle cell tumor (Figure 1). 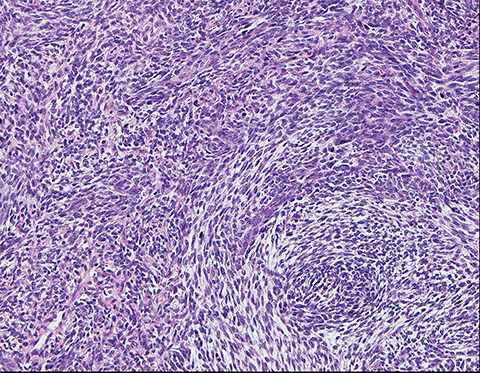 Although a sarcomatoid squamous cell carcinoma was initially included in the histologic differential diagnosis, the patient’s age and the characteristic appearance in the hematoxylin and eosin (H&E) stain favored the diagnosis of synovial sarcoma. 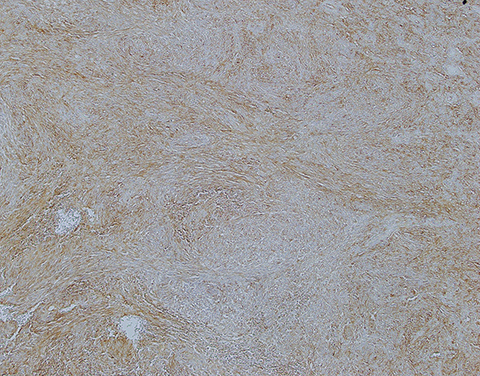 Multiple immuno-stains were done for confirmation (Table 1, Figure 2). 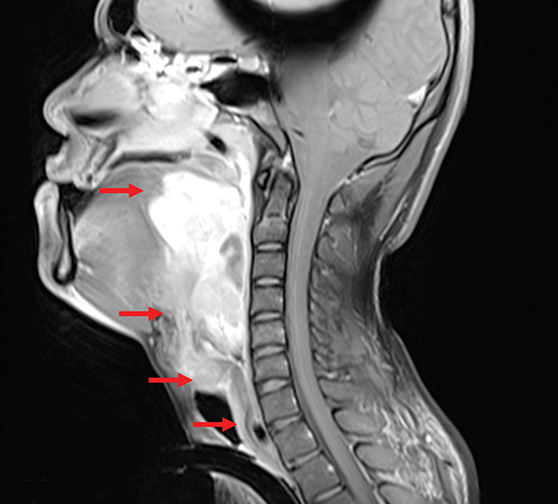 Head and neck magnetic resonance imaging (MRI) with gadolinium revealed a complex 10.4 × 7.6 × 5.1 cm (CC × W × AP) mass occupying the posterior oral cavity, oropharynx and larynx (Figure 3A). Few subcentimeter cervical lymph nodes were also seen. A 0.6-cm pulmonary nodule in the left upper lobe was noted on chest computed tomography (CT), deemed to be inflammatory. Direct laryngoscopy under general anesthesia was then attempted. However, during the procedure, profuse bleeding (~500 cc) from the mass was encountered. The procedure was terminated after achieving adequate hemostasis. In light of the tumor’s friability and propensity to bleed, and after careful review of the scarce literature regarding this rare malignancy, the head and neck tumor board decided to pursue neoadjuvant radiation therapy with concurrent chemotherapy consisting of 30 mg of weekly intravenous doxorubicin. Surgery was planned for after assessment of response to neoadjuvant treatment, should the sarcoma become resectable. During initial consult with radiation oncology, a foul-smelling, fungating mass was visualized in the posterior oropharynx, while a subcentimeter cervical lymph node was palpable on the left submandibular area. Three-dimensional conformal radiation therapy (3DCRT) was delivered using a linear accelerator with a 6-MV photon beam. The gross tumor volume (GTV) included all gross disease on physical examination and contrast- enhanced MRI. The clinical target volume (CTV) was generated by adding 2 cm to the GTV, shaving off bone and muscle. The planning target volume (PTV) was the CTV plus 0.5 cm. Bilateral neck levels 2 to 4 were electively covered due to the propensity of synovial sarcoma to metastasize to the lymphatics. The plan was to administer 200 cGy daily fractions for 7 weeks to a total dose of 7000 cGy to the PTV. However, by the sixth week, the patient developed excessive secretions that prevented him from lying supine for his radiation therapy treatment in spite of suctioning, anticholinergic medications and sedation. Treatment was stopped at 6 weeks, having delivered a total dose of 6000 cGy to the tumor and bilateral neck. There was grade 3 radiation dermatitis, which eventually healed after local wound care. The chemotherapy course was unremarkable. Six weeks after treatment, repeat MRI with gadolinium showed a decrease in the mass to 7.8 × 4.5 × 4.8 cm (CC × W × AP) with interval resolution of its oropharyngeal, oral cavity and glottic extensions (Figure 3B). The planned stepwise surgical resection then commenced beginning with excision of the supraglottic mass via transoral approach (Figure 4). Completion laryngectomy was done 3 weeks after. No untoward events were noted intraoperatively or postoperatively. The final histopathology report showed monophasic synovial sarcoma, 4 cm in greatest dimension, with 60% tumor necrosis involving the left glottis and supraglottis. No lymphovascular space or perineural invasion was noted. All surgical margins were clear, ranging 0.7 to 2 cm. No further adjuvant treatment was warranted. Thereafter, close follow-up with clinical examination and imaging as per National Cancer Center Network (NCCN) guidelines will ensue. Laryngeal synovial sarcoma is a rare head and neck malignancy with approximately 20 cases reported in the literature.2 The most reported site of presentation is the parapharyngeal space, while the larynx is the least frequent site of occurrence. There is very limited literature on head and neck synovial sarcomas, with the majority being case reports and single-institution studies. The management of these rare tumors, and of head and neck sarcomas in general, has largely been extrapolated from studies on the more common extremity sarcomas. Although surgery followed by adjuvant radiation therapy is standard treatment for soft-tissue sarcomas, it is associated with high rates of local recurrence particularly in patients with head and neck sarcoma, incompletely resected sarcomas and large soft-tissue sarcomas. Hence, studies investigating treatment alternatives—including the addition of chemotherapy and concurrent chemoradiotherapy—have been pursued. Patients with head and neck synovial sarcoma have a high likelihood of harboring distant metastasis; therefore, more effective systemic therapy is necessary. While synovial sarcomas are known to be chemosensitive tumors, the role and benefit of chemotherapy in the treatment of soft-tissue sarcomas in general is not as well defined as that of radiation therapy. There is even less literature concerning chemotherapy in head and neck sarcomas, more so the case for neoadjuvant chemoradiation for head and neck cancers. This approach aims to primarily improve local control without compromising function, and to abate micrometastatic disease early on. Our patient with primary laryngeal synovial sarcoma represents a rare case that was treated with neoadjuvant chemoradiation therapy. 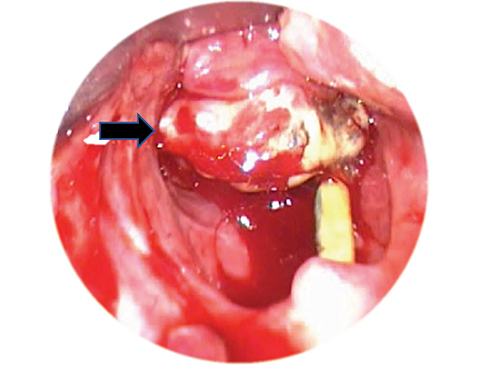 This case demonstrated how neoadjuvant chemoradiation therapy successfully facilitated oncologic surgical resection of an initially unresectable laryngeal synovial sarcoma. Close patient follow-up will continue to monitor disease outcomes. Head and neck synovial sarcoma is a rare disease entity posing several diagnostic and treatment challenges. Hence, a multidisciplinary team approach consisting of head and neck surgeons, radiation oncologists and medical oncologists is optimal. In the absence of evidence-based guidelines and randomized prospective studies, management decisions for head and neck synovial sarcoma should be individualized. Novel approaches to treatment should be investigated for their potential to improve patient outcomes. Sturgis EM, Potter BO. Sarcomas of the head and neck region. Curr Opin Oncol. 2003;15(3):239-252. Narayanan G, Baby A, Somanathan T, Konoth S. Synovial sarcoma of the larynx: report of a case and review of literature. Case Rep Otolaryngol. 2017;1-6. doi:10.1155/2017/6134845. Tos AP, Sciot R, Giannini C, et al. Synovial sarcoma of the larynx and hypopharynx. Ann Otol Rhinol Laryngol. 1998;107(12),1080-1085. doi: 10.1177/000348949810701215. Mucke T, Mitchell DA, Tannapfel A, et al. 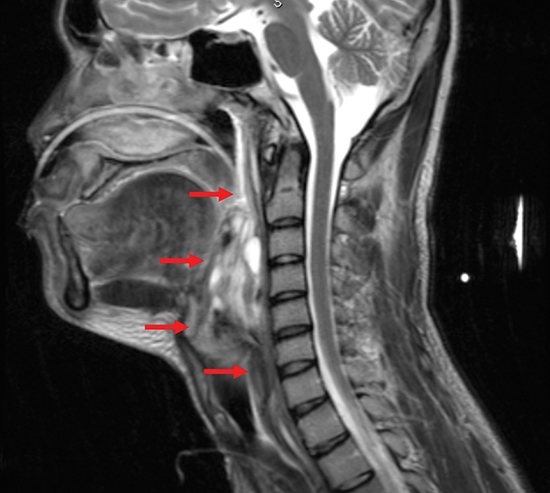 Outcome in adult patients with head and neck sarcomas: 10-year analysis. J Surg Oncol. 2010;102(2):170-174. De Bree R, van der Waal I, de Bree E, Leemans CR. Management of adults of tissue sarcomas of the head and neck. Oral Oncol. 2010;46(11):786-790. Shellenberger TD, Sturgis EM. Sarcomas of the head and neck region. Curr Oncol Rep. 2009;11(2),135-142. doi:10.1007/s11912-009-0020-8. Barker Jr JL, Paulino AC, Feeney S, McCulloch T, Hoffman H. Locoregional treatment for adult soft tissue sarcomas of the head and neck: an institutional review. Cancer J. 2003;9(1):49-57. Eeles RA, Fisher C, A’Hern RP, et al. Head and neck sarcomas: prognostic factors and implications for treatment. Br J Cancer. 1993;68(1):201-207. Barosa J, Ribeiro J, Afonso L, Fernandes J, Monteiro E. Head and neck sarcoma: analysis of 29 cases. Euro Ann Otorhinolaryngol, Head Neck Dis. 2014;131(2),83-86. doi:10.1016/j.anorl.2012.11.007. Cruz-Lim EM, Adevoso-Cañal JP. Neoadjuvant chemoradiotherapy for laryngeal synovial sarcoma. Appl Rad Oncol. 2019;8(1):45-48. Dr. Cruz-Lim is a radiation oncology resident, and Dr. Adevoso-Cañal is a radiation oncology consultant in the Section of Radiation Oncology, Department of Radiology, University of the Philippines-Philippine General Hospital, Manila. Disclosure: The authors have no conflicts of interest to disclose. None of the authors received outside funding for the production of this original manuscript and no part of this article has been previously published elsewhere.